We frequently get the question of what is the best road trip or traveling snack, and now we can confidently say Low Carb Beef Jerky made at home! Matthew and I always face the dilemma of having to cut back on our favorite snack, beef jerky, due to the high sugar content in most store bought jerkies. So, naturally, we were left no other choice but to make a recipe for easy, homemade beef jerky! Check it out below. Now You Can Have The Best Homemade Beef Jerky Too! To get the best homemade beef jerky you'll ever eat all you need is a low in fat cut of meat and a can of your favorite Zevia. We went with the flavor of cola this time around, but we also think their cream soda and Dr Zevia would make great options for homemade jerky. The Zevia comes into play during the marinating process. Marinating is something that ups the flavor on any meat 100 times so we think its important, especially in this case! When looking for the right meat, the most important thing to take note of is its fat content. You want a very low fat content and then to trim any fat that is on the meat prior to cooking. I'm sure you can guess that fat doesn't make the best jerky! We went with top round for our recipe, but other good options are bottom round, flank steak and sirloin tip! We know, it's even easier than you expected! You can mess around with different cuts of meat, different seasonings and even different size jerky strips. One thing to note, however, is the thicker the strips the longer you'll want to marinade for the flavor to really come through. Thicker strips would also mean cooking it for longer! Some other great on the go snacks are our Pizza Zucchini Muffins and Parmesan Crips, but this Low Carb Beef Jerky is definitely our number one go to snack! 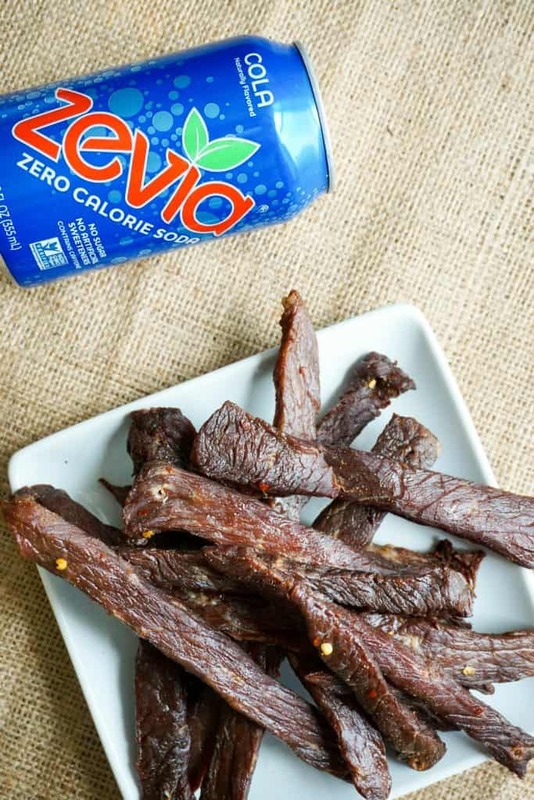 Recipe can be quickly added to MyFitnessPal - Search "KetoConnect - Low Carb Beef Jerky"
Pour a can of zevia into a gallon size ziplock bag and add the soy sauce, rice wine vinegar, liquid smoke and add the seasonings. Trim the top round of any excess fat and cut into strips to your desired size. We like them on the smaller side for easy grab and go! Add the cut up strips into the marinade and shake around. Seal the bag (removing any excess air) and place the bag into a bowl so there is no leakage. Place the bowl into the fridge for at least 4 hours and up to 24 hours. Once the meat has marinated remove the bowl from the fridge and pat the strips dry with paper towels (the marinade will have already penetrated the meat enough!). Using the bamboo skewers pierce the tip of the meat so you have anywhere from 5-7 pieces of meat hanging from each skewer. Set your oven to its lowest setting (we did 170 degrees) and hang the skewers through the grates in the oven so the strips are hanging. Bake for 4 hours (for thicker strips you may need to bake longer), remove from oven and serve immediately or store in the fridge up to 1 month. NOTE: 3lbs raw meat will yield 1lb cooked jerky.